Go gingham! 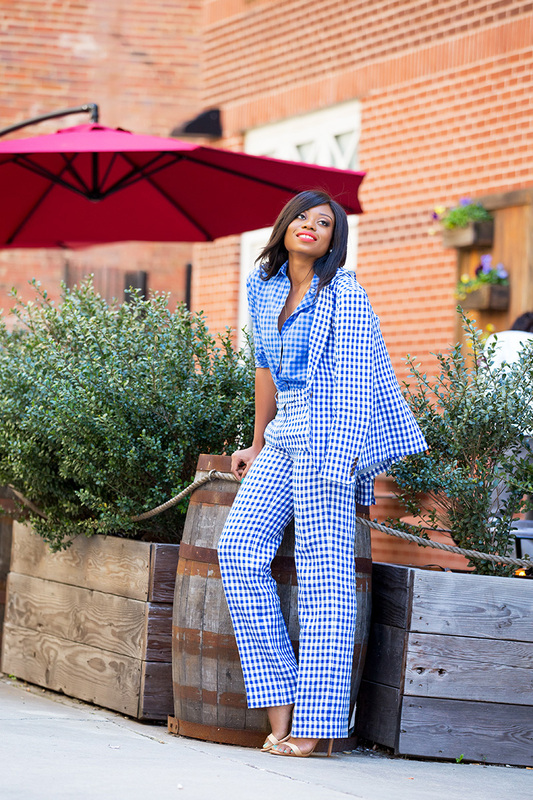 A few weeks ago, I mentioned here how gingham prints will make waves this season and my love for gingham prints. This takes me back to my elementary school days where school uniforms were made with gingham prints. There are so many ways to add gingham prints to your style. 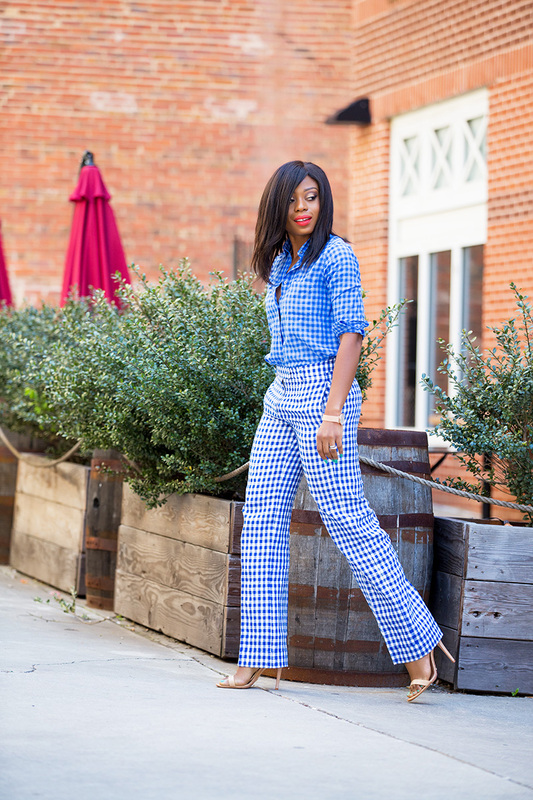 You can style as a work style by pairing this gingham shirt with a pencil skirt or pants. 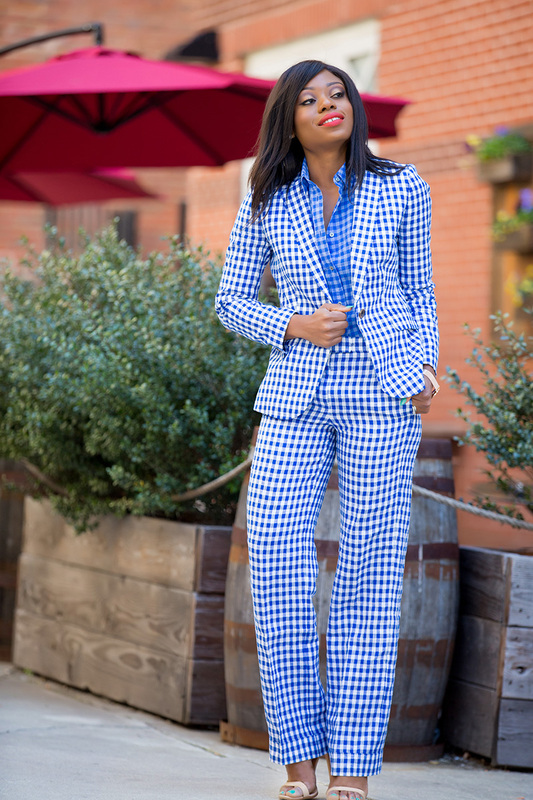 This gingham blazer with a button down white or navy shirt over a skirt or pants will equally be great for work. Casually, ginghams can be paired with jeans and the styling is limitless with the abundance of gingham pieces and colors from shorts to skirts and pants. For example, I wore shorts with a similar pattern to the pants on this post while in Dallas for the 'rewardStyle' conference. I posted some pictures on my Instagram page and I will add to my collection, this Ann Taylor top and shorts which I will pair together or wear separately. Today’s look is all about gingham i.e. from the blazer to the pants and for contrast, I added a slightly different color. If you are skeptical about mixing both prints, you can substitute the shirt with a white or blue shirt and if you want a casual approach, you can add a white/graphic tee. I love the whole look. Gingham is such a classic print and I love the way you did it in abundance. Love the way you styled it. Gingham reminds of daywear in boarding school. EVERYTHING about this look is amazing. I saw it in the Like2know it blast and had to find you blog. Pure perfection!